Black and white comic-style character design. This is my first featured character concept art. I don't have any set ideas for who he is or even what his name and personality are. I was thinking that he would belong in a dystopian, modern world and he is possessed by a grim alter ego. I feel that this world would be best presented through a graphic novel story. For this particular piece, I was influenced by comic art, especially that from DC Comics. In particular, the famous Batman villain Two-Face is an obvious inspiration for this character's design. 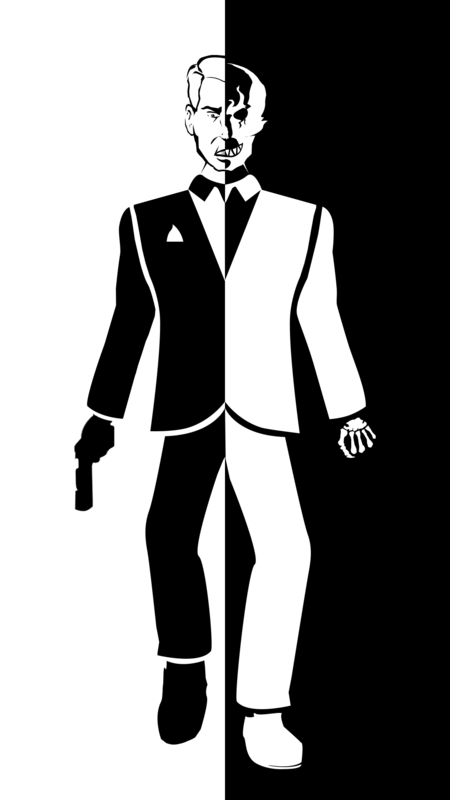 However, unlike Two-Face, this character can change into his human and demon forms at his own will.